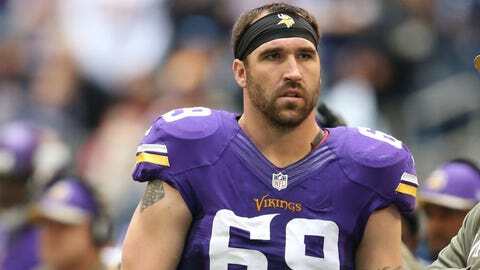 Jared Allen, 31, is in the final year of a six-year contract with Minnesota. EDEN PRAIRIE, Minn. — Jared Allen will make one promise: Sunday’s game will be his final game with the Minnesota Vikings in the Metrodome. Sunday will be anyone’s last game in the Metrodome, the 31-year-old building that has been home to the Vikings since 1982 and will be torn down and replaced by a new $1 billion stadium to open in 2016. Allen’s future is a little more clouded. Allen, 31, is in the final year of a six-year contract with Minnesota. Aging and costly, his final days with the Vikings seem numbered. But Allen, who corrected a reporter who said Sunday’s game "might be" his final game at the Metrodome, said he hasn’t resigned to himself that this is his last game with Minnesota and said he isn’t thinking about what might happen after the season. "You guys put a lot of words in everybody’s mouth," Allen said Thursday. "I’ve said all along I’ll cross that bridge when it comes. Me and the Vikings have been on the same page throughout this whole thing. Put it this way; I’m not naive to the point that I don’t understand the business side of this or understand the trends that have happened in the past. So I understand, and they understand I got a decision to make too. So when the time’s right we’ll sit down and see how it plays out." Allen is making $14.28 million in base salary in the final year of his deal. On a defense that has overwhelmingly disappointed and is on pace to set a franchise record for points allowed, Minnesota can’t afford to bring back Allen — who will be 32 when next season begins — with such a lofty price tag. Allen is one of multiple players set to reach free agency on a defensive line expected to undergo major changes in the offseason. Minnesota signed defensive end Brian Robison to a four-year extension earlier this year and has rookie defensive tackle Sharrif Floyd on the first-year of a four-year, first-round rookie contract. Otherwise, only defensive tackles Letroy Guion and Chase Baker are signed into next season. Kevin Williams, who has lined up next to Allen for the past six years, was approached last offseason and restructured his contract, eliminating the 2014 season on his deal. Allen, despite a $17 million cap hit, wasn’t asked to restructure. He was thankful both sides were living up to the original contract signed in 2008 as part of the agreement when he was traded from Kansas City to Minnesota. "I decided at the beginning of the year, I’m just not going to focus on it," Allen said of his future. "Some things are out of your control and this one is out of your control. We’re moving forward. And when the smoke settles everybody will be where they’re supposed to be, whether it’s here or whether it’s not. That will be decided at that time, but right now I’m having fun getting a chance to put this uniform on one more time. … And I get to be part of shutting down the dome. That to me, being a part of NFL history, you can’t ask for anything better than that." Allen and Williams could be looking at their final games with the Vikings, and together as one of the top defensive line duos of the past decade. Part of the emotion for Allen on Sunday will be helping to close out the Metrodome, but also knowing it could be the last time he lines up next to Williams. "I joked with him today, I don’t’ want anybody crying around him on Friday and Saturday," Allen said. "But we’ll enjoy it when the time is right. After the game, that’s the time to get sentimental (and) you look back on it. But you know, we always reflect. I think the only way to move forward is to reflect on your past and learn from the mistakes and learn from your successes and push forward that way. It will be one of those moments where it’s kind (of) drop your shoulders and you look at your brothers in arms and you think maybe this might be the last time. But again we all got a job to do Sunday and I’m going to take advantage of playing with him one last time for sure." Allen said when the time comes he will speak with his family and make the tough choices that are inevitable. He said he does think about the situation, but choose not to dwell on the unknown. Allen said his body feels good and he’s tied with Derrick Thomas for 13th all-time in sacks with 126.5. He has at least a half-sack in four straight games and is a half-sack shy from the eighth season of double-digit sacks in his 10-year career. "I’m just enjoying the ride, honestly," Allen said. "If this ends up being my last game here, then it’s been one of the greatest rides I’ve ever been on. It’s been a great six years. Like I said, this community will always be a part of me, I’ll always be a part of it, and it’s one of those things where I just have so many blessings that have come from here. And if I get to play here longer, then my ride will continue and we’ll go from there. So when the time comes, we’ll make decisions, but that time is not right now."